Shortly after Axios published its story this morning, saying that Rod Rosenstein had "verbally resigned" to John Kelly, Justice Department spokeswoman Sarah Isgur Flores drafted a statement that would announce Rosenstein's departure, written in the voice of Attorney General Jeff Sessions. Driving the news: The White House received the statement within an hour of the Axios story being published online, according to a source close to the White House. Flores would not comment on the record about her statement. Between the lines: The statement does not include the word "resignation." 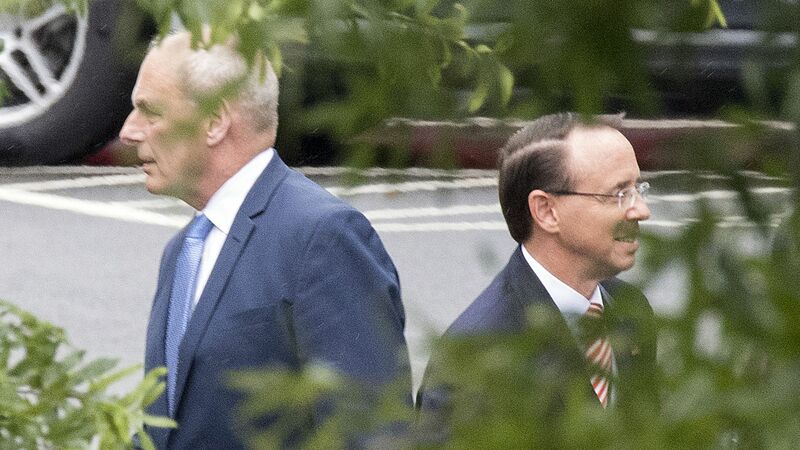 Sources close to both Kelly and Rosenstein have told Axios that Rosenstein had told Kelly in their conversations over the past several days that he was willing to resign and that the two men were discussing the terms of the departure. Sources close to Trump have told Axios, for months, that the President wanted to find an excuse to get rid of Rosenstein. The draft statement from Sessions says: "Rod Rosenstein has served the Department of Justice with dedication and skill for 28 years. His contributions are many and significant. We all appreciate his service and wish him well." The draft statement goes on to say that Sessions' chief of staff Matt Whitaker would go on to serve as his deputy, and that Noel Francisco, the Solicitor General, would serve as the Acting Attorney General overseeing the special counsel investigation. When I asked Flores whether she denies that Rosenstein offered his resignation to Kelly, she replied: "My only statement is that Rod is the DAG [Deputy Attorney General]." The bottom line: It's unclear whether President Trump will fire Rosenstein if he refuses to resign when they meet on Thursday. Note for readers: I regret the way I wrote this morning's version of the story. By saying Rosenstein had “verbally resigned” to Kelly rather than “offered his resignation,” I conveyed a certainty that this fluid situation didn’t deserve. It’s an important nuance, and I regret the wording.